Hafa Adai and welcome to the marine world of Guam, USA. Guam has the richest coral reef marine environment of any United States territory or state. Thriving with more than 1,000 fish species and over 400 kinds of corals and a diverse set of marine invertebrates. In short, Guam has what divers want through its offering of superb Pacific coral reef biodiversity. But the submerged natural marvels are complemented by much more. Guam also has a rich historic past that includes shipwrecks and submerged remnants from the wars of WWII and WWI. There are even sites from the far past of the early trading days of Spain’s gold-bearing Manila Galleons. Guam’s beautiful topside landscape extends into the sea. Volcanic in the south and limestone forest in the north, this unique geologic combination gives divers steep, dramatic drop-offs, coral gardens, sloping reefs and Cocos Island, a barrier reef island in the south. 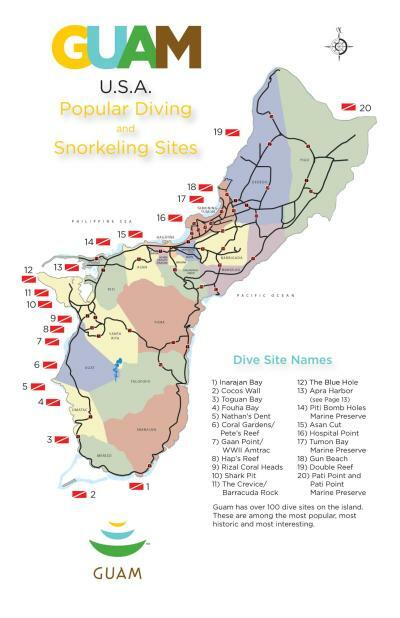 The coastal areas are pocked with protected bays and coves that are great for snorkelers. Guam now has a series of marine preserves that can be easily accessed from shore for easy snorkeling. The north provides limestone caves and swim-throughs. And, Guam’s water is consistently warm and clear. Divers, snorkelers and beach lovers can enjoy Guam’s marine world throughout the year. Guam is by far one of the safest dive destinations in the world in terms of both security and health. As an American Territory, it has U.S. Coast Guard and Navy patrolled waters. Dive boats are all certified through the U.S. Coast Guard and local Guam agencies. All boats are required to carry oxygen and safety equipment. Guam has Navy and civilian recompression chambers for treatment of any possible diving accident. High standards are followed by the dive shops to ensure Guam retains its reputation as a safe, fun destination for those who want to enjoy the amazing sea. Equipment: Many divers are pleasantly surprised to find that Guam is tax free and is well- stocked with all major brand name diving gear. There are also some scuba equipment bargain deals to be had at the various Guam dive shops. If one wants to travel light, Guam has everything a diver needs for rental. Guam waters are 82-86F (28- 30C) degrees year &apos;round with normally excellent visibility. A lycra skin will suit most divers. Local divers use 1.5 – 2 mil wetsuits and only the acclimatized use 3 mil. Above water temperatures never get below 74F (at night) and never get above 90F (daytime). Instruction: Guam also offers all levels of instruction from beginning open-water and one- day resort experience through advanced instructor training. Technical diving is also taught on Guam with reef and wreck venues for in-water training on scuba and rebreather. PADI is the major certifying agency here. Imaging: Underwater photography can be rewarding. Digital printing is available. Guam also has a professional camera center that carries some top camera brands. Serious photographers should bring all of their own camera gear. There is an authorized Apple sales and repair facility on Guam and PC sales and repairs are also found on the island. Clothing: Guam is tropical and almost always sunny. Bring protective clothing like a long- sleeved T-shirt and brimmed hat. Sunscreen is a necessity. Getting There: Guam is daily served by dozens of flights from all over Asia and the Pacific. There are numerous direct flights from Japan, Korea, Taiwan, Philippines, Shanghai, and Hong Kong. Money: Guam is a U.S. territory and uses the U.S. dollar. Major credit cards are accepted. Electricity: Guam has 110V with the standard US two-prong flat pin plug. Stay: Guam has a large selection of hotels for every class of traveller. Eat: A huge selection of restaurants and cuisines can be found on Guam. DISCLAIMER: The information provided in this document is noted in good faith and based on bona fide information. Please verify all information on your client&apos;s arrival to ensure a safe and pleasurable dive trip and that their dive certification card is readily available. Products and services offered by the participating local dive shops vary in offers and prices. The Guam Visitors Bureau accepts no responsibility for any loss, inconvenience or injury sustained by any person using this information.